It's been a week sinceEducon2.2. Countless blog posts have been written and the stream of Tweets with the#educonhashtag is still, well, streaming. So, a week later, this constant stream of information brings me back to theconversationthatLiz Davisand I facilitated. 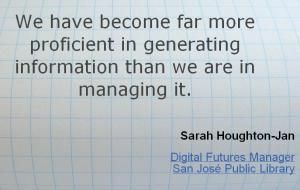 I think the quote fromSarah Houghton-Janthat we shared before we began ourprotocollast Sunday really resonates with me now as we are generating all this content about Educon, and I am curious as to what everyone is doing will all the information. information than we are in managing it." When people ask you where you find the time to do all that you do and read all that you read about education, do you stop and ask them what they are doing with their time? Do you ask them how many countless hours they spend watching commercials or TV in general? Do you ask them what they listen to while they are exercising or commuting? What do people do with their time? Actually, I took some flack fromMike WackerandSean Nashabout using aWordleto give a visual of what the group was collectively using, but oh well. We usedGoogle Formsto do some group questioning and then could have used the Spreadsheet Gadget to do an embedded Word Cloud in the Spreadsheet, but Wordle has so many more options. Is there something you are doing with your time that you could eliminate or reduce to pursue something you are interested in professionally?Is that so bad? Do you realize you are not alone? Talk with people about what they do to manage their information. We would have never heard about howBen WilkoffusesGmailto manage his informaton without the conversation at Educon. Now we just need him to make the screencast or write the blogpost we urged him to create. We all didn't have the solution to managing our information, but we took comfort in knowing that we weren't alone and in being able to talk openly about different ways to manage all the information. Is there something special that you do? Is there someone that helps you manage your information? Is there something that you heard in our session that you have tried and found to be successful?